Thua Thien-Hue (VNA) – The total output of aquaculture and fishing of the central province of Thua Thien-Hue reached 17,736 tonnes in the last five months, a year-on-year increase of 15.43 percent. Of the figure, aquaculture contributed over 2,700 tonnes while fishing, over 14,942 tonnes, up 4.4 percent and 17.8 percent, respectively, showing the recovery of the locality’s aquaculture and fishing after the marine environment incident last year. As many as 950 billion VND (nearly 41.9 million USD) of compensation has been handed over to local authority so far to pay for locals, who were affected by the incident. Accordingly, over 270 billion VND (11.76 million USD) was earmarked for owners of trade entities in coastal wards, communes and townships in the fourth time of compensation. 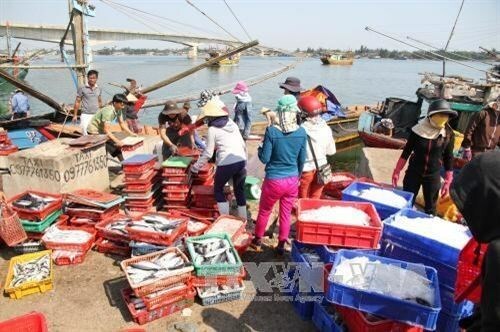 Vice Chairman of the provincial People’s Committee Nguyen Van Phuong said local authority continues to direct local residents to use the compensation in right purposes to resume production, aquaculture and fishing activities, towards stabilising sustainable livelihoods. The pollution also affected more than 260,000 people who earn their living from the sea.